The professions have always occupied a marginal position in society, peripheral to the main divisions of class, status, power and interest. This is still the case even though the professions have changed from being an addendum to the nobility and gentry to being part of the occupational élite in modern society. Change in the position of the professions has been contingent on changes in the society around them. The aristocracy’s traditional claim to power and status has lapsed in favour of the utilitarian claims of the industrial, commercial and political élites. Among such élites the professions stand out as a group whose members share common socio-economic origins, educational experiences and life-styles and a common, if confused, ideology of professionalism. 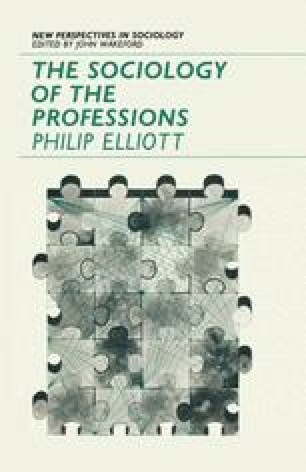 In contrast, other contemporary élites, though they may be more closely linked internally through such traditional mechanisms as kinship ties, tend not to appear as such a unified group.2 The professions have benefited from the process whereby occupation has become the main basis of differentiation in modern society. They appear to fill the vacuum in mass society,2 but this appearance can be challenged both on the grounds that they do not constitute a conscious, coherent élite group and that their grasp on power and rewards in society is limited and insecure.